Last night I was observing again in Aska village, for last time now. That is a little bit unfortunate, because I have really enjoyed my time there, and I had just found a considerably good observing place there! 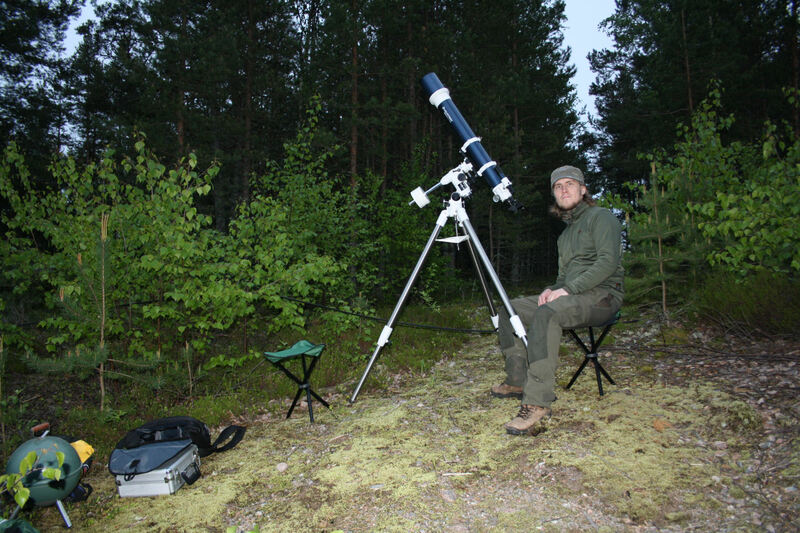 Last night I went there (it it a cutting area and a sandpit about 1 km north of our accomodation) and I observed there SN2011fe, Z Uma, Messier 33 and Messier 34. In early evening, there were some clouds, but they went away after all. Then the sky was really dark (SQM at best 21.40) and it was good to make observations. There was some mist in the air though, and it got thicker and thicker, and I had to stop observing around midnight. And there wasn’t much aurorae in the sky, there was only some weak aurora arc low in the northern sky, but it wasn’t causing any interference. Now the supernova of Messier 101 is getting fainter, it’s brightness was only 11.0 magnitudes last night. Z Uma is getting brighter, it’s brightness was 7.8 magnitudes. Scanned sketches will be coming later when I can scan those sketches.